My family was never poor financially, but we are poor in a way that is very little understood. My mother is a compulsive hoarder. She suffers from a mental illness which makes it difficult, if not impossible, to discard items which most of us would consider to be trash. She is almost completely incapable of distinguishing between the useful objects of daily life and those objects which are broken, trivial, or even unsanitary. To her, nearly everything is "important", "might come in handy", or "will be worth a lot of money someday." Any attempt by a family member to throw away even a ten year old piece of junk mail is likely to be greeted by my mother with a fit of rage or a flow of tears. At the same time, my mother is extremely intelligent and very charming. She can speak knowledgeably about nearly any subject, and, with an infectious laugh and a quick wit, she has always been popular "outside." I grew up in this environment. For years, I was convinced that my mother loved "things" (like coupons, newspapers, and junk mail) more than she loved her family. My siblings and I were deeply ashamed of our living situation, and I would be lying to you if I said that we were past the pain, the conflicted feelings of shame and anger, and the constant struggle to salvage a sense of identity and self-esteem. We didn't understand that our environment had its roots in a mental illness. We thought that we were the only ones who couldn't invite friends over to visit. We were wrong. Compulsive hoarding is a serious mental illness with significant public health consequences, and a million or more people in the United States are estimated to suffer from it. While no cure for the condition is yet known, the pace of research on this disorder is increasing, and support groups are springing up on the internet and in a range of communities. 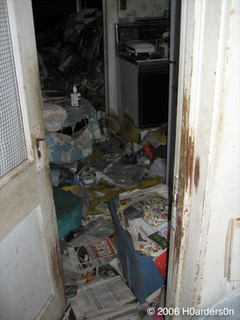 With this website, I hope to share some of my experiences with having a compulsive hoarder in the family, and I hope to help others learn that they are not alone, either. I'll try to post at least once a week until I feel that my story has been told. In the meantime, if you are a child of a hoarder or know a child who may be in such a situation, please take a look at childrenofhoarders.com or its private Yahoo! group, both of which have been very helpful to me and many others despite only being online for a few months each.